Its been a rough and tumble year. Things started off looking extremely promising then in a matter of months multiple projects and one bigger one all came to a crashing halt. The rough… A person I was working with for a nice boost on streaming media ended up stealing $14,000 from me. That might not sound like a ton of money, but as a non-signed artist that is paying for everything – that puts a serious dent in your operational cash flow. This is one of the primary reasons I’ve been so quiet here on my ‘dot com’. I’ve been out money to make things happen when I should have been seeing a return. In turn, this slowed my process down on making the finishing touches on my website. (grrrr). Its made it difficult for me to upgrade gear. I’ve been unable to do any PR. Not a fun position to be in. Right now I have someone working on getting that money back from them, but after 3 months of trying, I’m beginning to lose hope. Another element of fallout from this is losing the lovely lady I had been dating for nearly a year. That was a blow as well. The tumble… They (whomever ‘they’ are) say “roll with the punches.” I’m feeling more like I’ve been tumbling. Whilst I’ve been recovering from the theft, I’ve been finishing music. Lots of music. Some with co-writers, some for TV placements, some for my future releasing. Writing and recording all this music is part of what keeps me sane in such a conniving business. In other news. A device, that I developed for my own use a couple of years ago, is now generating interest from a couple of companies. I had a meeting with one company a week and a half ago at the end of July. The meeting was scheduled for 30 minutes. That 30 minute meeting ended up lasting an hour and 45 minutes. To me that’s a very good sign and sometime next week I will reach back out to them to follow and see where their thoughts are. In the meantime, I’ve started the patent process to make sure my idea is protected. Some friends of mine have started developing a content platform for YouTube. As it turns out, my channel and website titled Inside The Recording Studio will get rebranded to be the umbrella for all the content. I’m looking forward to providing cool content about gear, recording and the process of creating music. As I sit here recapping on several months of what feels like waiting in a holding pattern, I’m working on keeping a positive attitude going into my birthday. I’m taking yet another trip around that sun. Despite being beat down again in my career as a musician, I can be grateful for being alive and healthy! 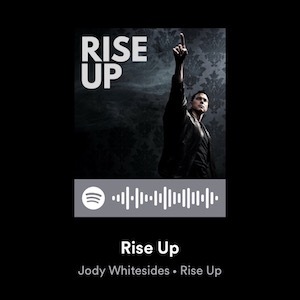 As the song image for Spotify shows above – I will Rise Up! I’ll work on being a bit more energetic with content here. In the meantime, thank you for reading. BTW – if you haven’t joined my email list, please do!